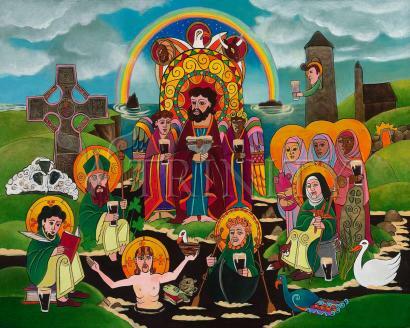 One of my favorite poem prayers from the old days is about Saint Brigid’s vision of heaven as a great lake of beer and the eternal hospitality all people experience there. I would like a great lake of beer For the King of Kings. I would like to be watching heaven’s family drinking it through all eternity. Her feast day is February 01. St. Brigid envisions heaven as being a place of infinite hospitality and pleasure in which people join with saints and even God drinking good health throughout eternity. I should like a great lake of beer to give to God. I should like the angels of Heaven to be tippling there for all eternity. I should like the men of Heaven to live with me, to dance and sing. White cups of love I’d give them with a heart and a half. Sweet pitchers of mercy I’d offer to every man. I’d like the people of heaven to gather from all the parishes around.